Lukas sent me an email letting me know about Sebastian Lang's Gerolsteiner Specialized Tarmac SL team bike from the Tour of California. I'm not sure why it's blurred out, we all know what type of bike it is. Today in that crash, we had Sebastian Lang come down pretty hard and had to abandon. 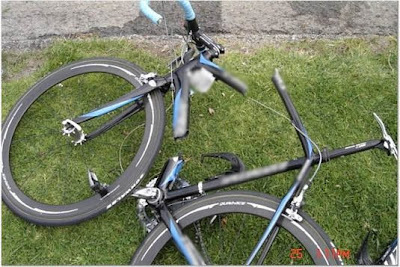 His bike was broken into three pieces... I was in front, but I think somebody hit a pothole and lost their grip and crashed.